Today’s topic: the man who keeps independent filmmaking alive. In an era where Hollywood blockbusters have taken over every big cinema theater in every country, independent cinema is starting to take a new turn and progress with time. Think about it, back in the day some of the biggest names were making movies for themselves instead of making them for big time producers. Quentin Tarantino himself started off by directing Reservoir Dogs with initially a budget of a mere $30.000 and then raised it with the help of actor Harvey Keitel to a more impressive but still low $1.5mln, this way creating what is hailed today as “the greatest independent film of all time”. The Coen Brothers made their first few movies – Blood Simple, Raising Arizona and Miller’s Crossing – with a just few bucks using either at the time unknown actors (Nicolas Cage, John Turturro) or washed up stars like Gabriel Byrne. Sure, other directors like veteran Michael Haneke, newcomer JC Chandor, Lisa Chodolenko, David Gordon Green, Lynne Ramsay are all skillful players of the same trade, but it seems like there is one voice that has done nothing but serve cinematic gems in a day where movies are usually overstuffed or overcooked with clichés and banalities. His tiny filmography gives us a glimpse of a man whose name someday will resonate across all audiences and whose signature will be visible in every book that belongs to film literature. His name is Jeff Nichols. No fancy suit and tie, no director’s chair, plain T-shirt. This is Jeff Nichols. The boy from Little Rock, Arkansas, grew up to become a true master at his craft, a young mind who sees what other choose to ignore. His filmography of just three films (other two coming out in 2016) has had a huge impact on movie buffs and the way we think about independent filmmaking. Nichols chooses topics that are easy to relate to and makes them much more profound than what we’d expect. His debut, the 2007 Shotgun Stories, about family members fighting each other, gave critics such as the late mighty Roger Ebert a reason to take an eye off Hollywood for a moment and focus on something smaller, more delicate but just as dynamic. Nichols’ choice of settings is very particular and probably very personal to the director: the American countryside. Again, what other directors choose not to look at, Nichols prefers to study under a microscope. Cornfields, abandoned farms, ruined backyards, outdated cars, conservative communities, it’s all there. The environment his movies are wrapped in is unpredictable, hostile, presenting a tough life for any age and gender. It’s the poverty and the thirst for a better life in a better place that is unreachable, which make the viewer swallow every bite of his tasty food with great difficulty. It’s the raw images that Nichols throws in the audience’s face. However, it’s not a grim vision. There is also a lot of good in his movies; fatherly love, friendship, parents’ devotion, sacrifice. There is always something worth fighting for. A family on the edge of destruction – Shotgun Stories. Nichols’ camerawork is steady. The movements are controlled, there is no rush in them, no shaking, the images he captures are almost a photo album filled with beautifully composed photographs. In his, in my opinion, best movie – 2011 Take Shelter – Nichols tells the story of a blue collar worker, a loving family man (played by Nichols’ friend and regular collaborator, the great Michael Shannon) who starts to have nightmares about an apocalypse, which to him becomes a reality. His goal? To save his family; his sweet wife (Jessica Chastain in top form) and his hearing-impaired daughter. Nichols manages to turn family love into a vehicle of danger and conflict. The man begins to build a storm shelter in the backyard, hurried by the dark visions that slowly start to take over his mind, making him a victim of his own fears and fantasies. It’s a small idea that takes over the screen, and turns into a giant, menacing vision of a society, which can’t tell the difference between fantasy and reality. The scenes where the husband, Curtis, sits down at the dinner table with his beautiful wife, Samantha and his daughter, Hannah, are the centerpiece of the action. Nichols chooses not to let the outside world creep into the plot, but rather mask a possible danger with the help of a loving unit – the family. What Curtis sees, hears and says at the dinner table, is what motivates him to drive further into the direction of insanity. Yes, it’s what it is. A brilliant example of minimalistic cinema bashing our heads in. Your family is worth making you lose your mind – Take Shelter. Nichols as a writer. Not only can he direct a tense scene with great ease and impressive simplicity but he can write too. Every character he creates is someone that feels so close to us, and yet so distant. A scary familiarity. That’s the case for his third and up until now, last movie – 2012 Mud. This time the writer/director explores the ruined villages located on the edge of the Mississippi. A merciless land where you either you make your living out of the river, you drown in it along with your debts. The titular Mud, is played by Matthew McConaughey (before the “McConaughey age” started, in some way Nichols introduced him to Oscar success), a square jawed, dirty man whose past is as mysterious as the fact that he lives on a boat trapped on top of a tree located on a river island. Mud is friendly and smokes a lot, and the only people he trusts to form a friendship with are teenage boys Ellis and Neckbone. Mud’s slurred speech and short sentences make of him a ghost, someone who may be there or may not, someone who isn’t entirely real. But Mud is, trust me. Nichols writes a friendship for the ages, three different individuals working on the same objective: take the boat off the tree and then… go on an adventure. It’s almost a romantic ballad, because Mud is looking for his old love that’s gone missing. As Nichols unwraps Mud’s past in front of our eyes we can’t help but ask for more. And in the end, it’s all worth asking. Three lives connected by a river – Mud. Nichols may be someone who prefers to stay low-key, work on small productions and shoot on a limited budget, but his stories are bigger than life and filled to the brim with raw truth. He’s an artist whose work is unique and very personal, both qualities that are very rare and precious in a world of mindless Marvel movies and cheap television. One day, his name will be cited in film classics. Maybe not. Nichols doesn’t make movies for that. He makes them to put a smile on his own face. That’s admirable. He’ll keep doing what he’s doing, ride on. Today’s topic: the death of the American Dream in O Brother Where Art Thou. There have been countless movies dedicated to the glorious understanding of the term “American Dream”, movies that won plenty of Oscars such as the legendary tale of a simple man who turns into an all star boxing champ in Rocky or even the story of greedy Wall Street businessmen in Oliver Stone’s Wall Street. The audiences clearly from the very beginning wanted to envision something so distant, so unreachable for the most part of the public: rise from nothing and either win everything or end up in the gutter. This concept was already born back in the early 1950s: the age of making business, living in suburbs, driving your own car, having preferably a four member family and breathing fresh air. So why isn’t Hollywood interested in showing that this “dream” is for the most part a simple illusion created by day-to-day advertisement, dirty politics and irrational thinking? Well, because Hollywood used to and still does up to this day produce what the public wants to see and believe. That’s why it takes a duo of brothers to abolish the idea that everyone loves. I’m talking about the Coen Brothers, Joel and Ethan. Three criminals on their way to stardom. The brothers from Minnesota are part of the last generation of writer-directors independent from the Hollywood way of filmmaking; they have their own style, their own set of rules and ideas, their own language and tone and something that is extremely rare in today’s movies – originality. Their voices resonate in a world where everything must obey someone or something. With the Coens the viewer never really knows what he’s about to watch – be it the story of a husband who plans to kidnap his wife for ransom money in Fargo or the story of a pacifist stoner who investigates the disappearance of a millionaire’s wife in The Big Lebowski, the two writer-directors have never stayed on the same track. The same thing happens when we watch O Brother Where Art Thou, the tale of three prisoners trying to find their way to a hidden treasure in 1930s Mississippi. In this 2003 Oscar nominated picture, we’re given all the realities of the American South, and not only. The brothers intend to present us the main problems revolving around race, money, corruption, the musical scene and human intellect that are still relevant up to this day and age on a worldwide scale. Labeled as a comedy, the film starts off with the sound of hammers beating on rocks, the voices of black prisoners chanting; we open up to a chain-gang. Hundreds of prisoners slamming their hammers against the dusty ground, guarded by armed deputies, under the heavy sunlight, dressed in plain striped uniforms, singing. The sepia cinematography by master Roger Deakins is used here to make us reflect on the whole situation right from the opening: prisoners, guards, in colour they’re all the same, it’s the politics that divide them. One holds a sledgehammer, the other a loaded rifle. When the three protagonists – Everett, Delmar and Pete – escape the chain-gang and manage to find shelter at Pete’s cousin’s house we’re presented with another problem; poverty. The three feast on a tasty dinner made of delicious horse stew – only problem is Pete’s cousin couldn’t afford anything else than the corpse of his rotting dead horse. And when the law enforcement comes looking for the three ex-cons, Pete’s cousin rats them out. Poverty, in a world where only the supreme and powerful have a say, leads to betrayal. Anything for money, for a hot plate, a cup of coffee, anything. Even your own cousin’s life. But that’s not the end of it. The boys, after successfully escaping a wave of other mishappenings, stumble into Baby Face Nelson (one of the most ruthless gangsters of the 30s America). They witness the madman driving a fast running car, shooting whatever his eyes catch – be it police cars or cows. And yet, when the day comes to an end, and the four men find themselves around a bonfire, resting, Baby Face Nelson melts down; from a murderous criminal he turns into a frightened child. And like that, he says goodbye to the gang and walks away, looking down, almost crying. The Coens write their characters with the highest number of contradictions they can come up with, and yet they still manage to leave these characters with a sense of humanity, and make them as realistic as possible; because they know, unlike most directors and screenwriters today, that people are not one dimensional. Even a feared gangster can still be a man deep down his soul, since there is no such thing as a lost cause in the Coens’ book, anything’s possible. There are no straight paths. When Delmar and Pete jump into the river to wash away their sins, we get a taste of human naivety and innocence. Hundreds of people, dressed in white, chanting “Oh brother let’s go down! Let’s go down to the river!” make their way through the thick bushes and twisted forest branches, finally stepping into the cold water of the Mississippi. It’s as if we’re witnessing a passage from the Holy Book, and indeed we witness a religious procession; salvation. Everett watches in disbelief as his two pals run to the priest, who helps them wash away their sins. The two prisoners believe it, the other hundred members believe it, a whole nation believes it. Or maybe they just wish they could believe it. The Coens want the audience to question the different point of views: who’s right? Everett for despising the religious act of salvation? Or Delmar and Pete for being so naive as to think that their criminal past could be forgotten with a simple splash of water? We even get to judge their choices when they’re confronted by a trio of beautiful sirens; like in Homer’s Odyssey, the gorgeous creatures lead the men to lose sight of their objective, slowing down the gang’s mission. Fantasies can easily seduce you. No worries. The Coen bros move when they know the territory. Who other than the Coens would have the guts and brains to write a State Governor candidate as the prime member of the local Ku Klux Klan? It’s a kick in the face to all those who think politics can be run honestly, all those who think that a good man can be a rich man. Fairy tales are for children. Here, the candidate running for Governor’s office organizes a private lynching of a black folk musician. The very man who wishes to run one of the largest states in the US hums to the drum roll’s rhythm, lights a crucifix and reaches out with a rope in his hand. If you think about it, the Coens’ crazy fantasy can be considered terrifying reality. Food for thought. The music. The music is the movie. Be it swing, country, folk, jazz, work songs, the music in O Brother tells the journey of the characters. The songs contain countless stories of spoiled politicians, prisoners having to work all day long, struggling musicians, devoted believers and starving farmers. The Coen brothers use music as a flashlight for the viewer, for him to find his way out of this messy, bizarre tale of men seeking a fortune… that in the end is not the fortune they seek. Their music describes the pain and suffering of a whole world, which keeps on dreaming, believing fantasies and apparitions. There is no American Dream within this music, nor within this life. And like that, with a simple comedy we’re taught what we’ve been always ignoring. Be your own shepard. Dream later. Today’s topic: the not so Spaghetti Western of Sergio Leone. The 1960s were a time of booming ecstasy in European cinema, especially the Italian, German and French, which were producing an average of 112 films every year. It may not seem as much compared to today’s Hollywood productions, but in those times the three countries I mentioned were on a roll. However, quantity doesn’t mean quality. In fact, most of those movies were called ”B-movies”; cheap, quick to make and either comedic or action-packed. In the main roles were either foreign, mostly American, washed-up stars or Italian good looking actors like Terrence Hill or Franco Nero. They weren’t there to play a part, they were there to carry a story. And that’s how Spaghetti Westerns got made; German, French and Italian directors would film stories of revenge and justice in the Spanish desert instead of Monument Valley because of budget restraints. Spaghetti Westerns were the bread and butter during those years, and honestly they all looked the same. Until the very day, one chubby Italian from Rome appeared on the Spaghetti Western stage: Sergio Leone. Maybe to some his movies seem too long and too predictable, but try and compare them to other movies of the cheap genre and you’ll notice that what this man did was start a Western Renaissance. It’s always quiet in the West. 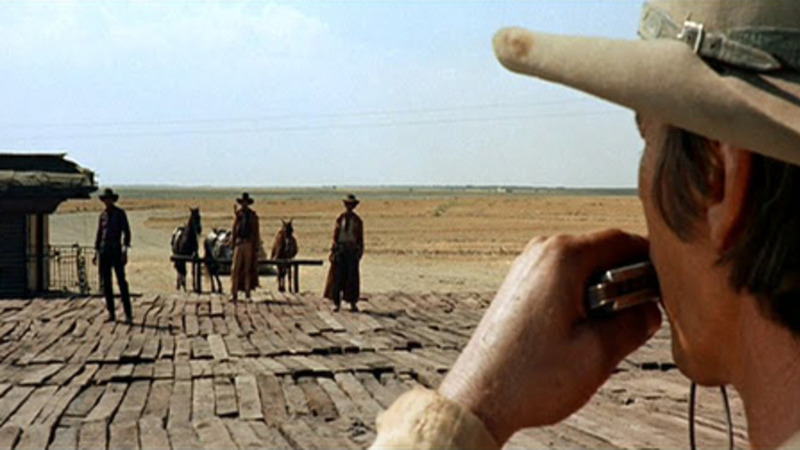 In this post I’ll have a look at what I think is his most mature work – Once Upon a Time in the West (1968) – which doesn’t mean that his other pieces of filmography aren’t worth discovering: the whole Man with No Name Trilogy has some of my favorite set pieces ever put on film; Duck, You Sucker from 1971 is hilarious fun, and Once Upon a Time in America, his last effort before his sudden death in 1984 is a brilliant gangster epic. On the other hand though, I can’t help myself but think that Leone reached a peak of his directorial efforts in his smash hit, Once Upon a Time in the West. Why is that? Well, take a look at the opening scene. No one, not even Hitchcock could reach the same level of suspense and tension that Leone used in every movie of his. The first twelve minutes are almost played out without a single word being said. The only sound we hear is that of a broken windmill spinning, a fly buzzing around, and water slowly dripping onto a man’s hat. It’s the details that make us nervous. Leone’s strategy is to create a very long moment of silence and then disrupt it into million pieces with the use of the loudest sounds available, to make the audience jump, to make the audience think on the importance of sound. In fact, his movies never really focus on dialog almost as if they were silent films. In Once, the opening scene follows three strangers covered with thick dusters and dirty hats. We don’t know who they are. We don’t know where they come from and why are we following them but for some odd reason we can’t take our eyes off them. They’re nasty, ugly looking men, for all we care they’re simple bandits waiting for a train, and yet Leone manages to make it interesting and fun just looking at them. And when the train arrives, the credits stop rolling, we witness the climax of all that we’ve been waiting for. The windmill stops. Henry Fonda’s blue eyes hide one of the most terrifying villains in the history of movies. Leone didn’t simply direct Westerns; by combining the ugly with the beautiful, the evil with the good, the present with the past he created art. A scene in Once that takes place in a sleazy saloon in the middle of the desert, where bounty hunters and filthy horsemen sit drinking and spitting, is a perfect place to introduce us the real nature of Claudia Cardinale’s character, the gorgeous Jill, a frightened yet strong woman that will face any man that stands in her way. How does the man behind the camera do it? Close-ups. That’s Leone’s trademark and something that went on and influenced later famous directors like Quentin Tarantino and John Woo. It made him recognizable. We see a close-up and we immediately know it’s him. And again it’s the attention to detail that shapes this movie. In American Westerns, well respected directors like John Ford or Howard Hawks would never use close-ups because they felt the West was all about the posture and strong figure of cowboys, muscular lawmen. Leone had his own idea. His focus was on the slight movements, barely visible tics, a tear in the corner of the eye. Leone’s details tell us more about a character than any form of dialog. In Once we have the mysterious character of Harmonica, played by legendary Charles Bronson, we know nothing about him and yet he’s one of the main characters of the movie. In that same saloon scene, Leone directs a close-up of Harmonica’s face while the man plays a tune on his silver instrument. We ask ourselves what’s the meaning of this close-up? And I say precisely that: the audience asking themselves a question. We raise questions because we’re curious and Leone delivers the answers with the same close-up at the very end of the movie, letting us finally discover the character’s identity, motivation and dark past. You’ll never play harmonica again. Finally, the score. Leone without composer Ennio Morricone is like steak with no fries. It’s good but the taste is not the same, it’s as if something’s missing. Morricone, an old friend of Leone’s from high school, would in some way help create the movie. He gave the director’s movies their identities, their spirit. Today almost everyone knows the celebrated tracks “Ecstasy of Gold” or “A Fistful of Dollars” with the recognizable whistle and whip sound because Morricone knew how to make the song not only suit the scene it played on, but make it memorable, make something special that people will always come back to and be left with their jaws dropped just like the first time they heard and saw it. Here, Morricone composes the chilling sound of a peaceful harmonica, and whenever we hear it we know who’s behind the instrument, ready to draw first. The cause of all the good and evil, the beautiful Jill. Leone created a new way of telling personal stories in an impersonal world. His guns didn’t always fire bullets; they fired emotions and bruised feelings. The protagonists weren’t always presentable good guys: they were people touched by the past. Luckily for us, Leone will always be the future. A faded past marches toward us.